When I am invited to create a wedding ring for a client I attempt to look beyond the obvious gold or platinum and diamonds, though they may be a part of the final design. What I look for are qualities or aspects of the ring’s design that has more importance than the sum of the materials. I search for things that are important to that individual’s life and relationship with their partner. 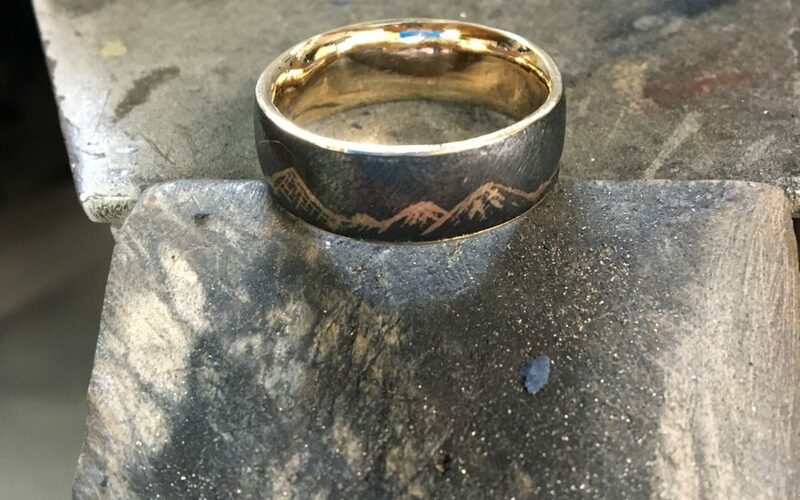 In a recent design for a Central Oregon man we decided that his wedding ring should revolve around one of my iron and gold wedding ring styles, but incorporating our local mountains just west of Bend, Oregon. The landscape will include the Three Sisters as well as Broken Top next to the Sisters, Mount Jefferson to the north and Mount Bachelor to the south. To add durability to the wedding ring I chose to inlay the mountains in red gold into the iron ring. To add a dramatic affect I oxidized the iron so that the red gold would standout. Finally on opposing sides of the ring I set 2 small white diamonds in to palladium tubes to represent the couple, their place in the world together and as stars in the sky perfectly balanced together over their beloved landscape.